I took a brief hiatus from blogging in mid-May thanks to a little life event...I got married! Then I went to Europe for our honeymoon! In the next series of posts I will try my best to capture all the great food we had during these 15 unforgettable days. The first leg of our trip took us to the Tampa Bay area where our wedding would take place. We flew in three days pre-wedding and had dinner at Chiang Mai Thai in St Petersburg on our first night there, a place I had randomly discovered while searching for food options online. 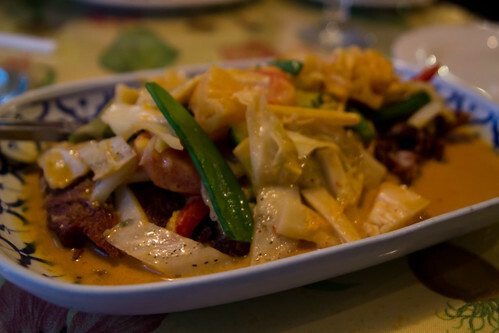 Located right in the heart of downtown St Petersburg near the Tropicana Field, Chiang Mai Thai is a pretty casual eatery serving standard Thai fare. 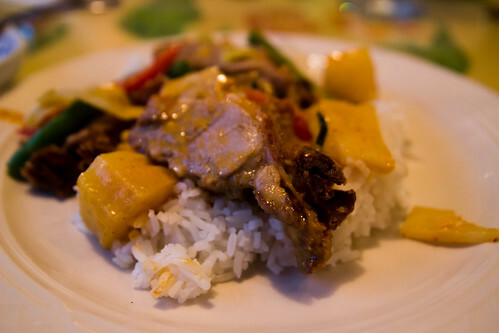 As per usual, I got curry: the Duck in Pineapple Curry, with pineapples, bamboo shoots, and various veggies. The duck was prepared a little differently than usual as it was fried, which was good. R. got a yellow curry that he enjoyed as well. 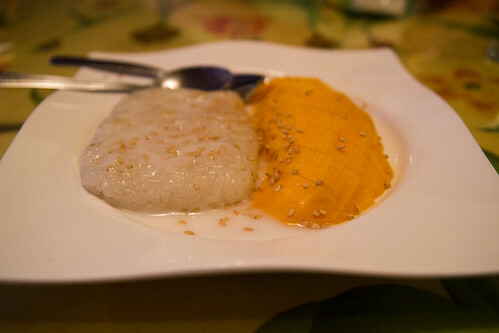 Since we both love Mango Sticky Rice, we decided to split one for dessert. I enjoyed Chiang Mai Thai, though I don't think it quite compares to some of the best Thai restaurants I've been to back home in Pittsburgh. Still, it was a nice way to start off our time in Florida.